Members of Manzan United FC pose with their management team after booking their spot in the semi-finals of the Caribbean Welders Fishing Pond Football League. 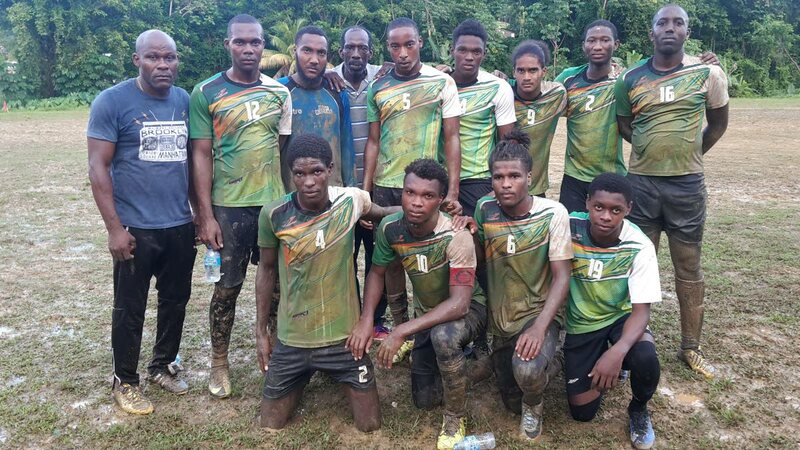 Manzan United battled to a 2-0 victory over Gremio in difficult conditions on Sunday to book their place in the semi-finals of the Caribbean Welders Fishing Pond Football League. Manzan took advantage of a sluggish start by their rivals to strike early and late to see off a disjointed Gremio team. Gremio looked to be playing in quicksand instead of a muddy field and found themselves trailing after Manzan captain Darkile Ferreira’s powerful shot flew past Gremio goalie Trey Eligon for a 1-0 lead. Gremio finally grew into the game but found the Manzan goalkeeper in impenetrable form as they went into the half still trailing. Gremio looked most dangerous from set plays but bad decisions in front goal made life easy for the Manzan defence. Gremio forward Joel Hoyte and his teammate were left bickering with each other after Hoyte headed wide from a floated cross in the box when his teammate looked in the better position to score. Gremio finally put the ball in the net after a a free-kick was not cleared by the Manzan defence but their joy turned to agony as the linesman ruled it offside. Substitute Ryan Martinez sealed the victory, though, intercepting a throw from Eligon and smashing in a right footed shot into the top right hand corner. Manzan will face Boys Town on Sunday in the second semi-final after the latter defeated Dream Team 4-1 on Saturday in an ill-tempered rematch of the 2013 final. Boys Town’s energetic striker Dorean “Bunny” Robinson was too much to handle for Dream Team with a hat-trick and arguably he could have scored five on the day. “Bunny”, after firing wide early in the encounter, lashed one from long range that sneaked under the goalie and trickled over the line but the linesman was unable to see and the goalie snatched the ball back into play to the dismay of the Boys Town fans. Errors continued to be mad ein the Dream Team defence and Boys Town went ahead courtesy an absolute gift from centre-back “Kiki”. Boys Town, the 2013 and 2016 losing finalists, won a free kick in their own half which was launched into the opposing penalty area where “Kiki” sought to trap the ball instead of clear and miscontrolled straight to Robinson who smashed it into the net to make it 1-0. Robinson almost made it 2-0 soon after, collecting a long pass on his chest while facing the wrong way and turning past three defenders onto his left before angling a low drive less than a foot past the right post. Dream Team, against the run of play, almost made it 1-1 in a mad sequence of play that saw the ball hit the crossbar once, the post twice and cleared off the line twice in a desperate bit of defending. But “Bunny” again showed great predatory instincts to double the advantage, initiating an attack on the left before drifting inside to feed Shaydon “Boyo” Primus, whose fierce drive was spilled by the ‘keeper where “Bunny” cleaned up with an easy tap-in for a 2-0 scoreline at the half. Dream Team introduced forward Patrick Parris for the second period and the move almost paid immediate dividends but his shot after he was slipped through with a reverse pass was too weak. Dream Team pulled one back, though, the Boys Town goalie missing a punch off a right-sided cross after Parris attacked the near post and a Dream Team player scored from the six yard box. But Dream Team were again found wanting at the back and their goalkeeper seemed to run past the ball trying to stop substitute Isiah Smith in a one-on-one and had no choice but to foul him. Their predicament turned from bad to worse after defender Keryl ‘Gino” Garcia got into a fracas with Smith and received his marching orders. Kureem Clayton stepped up for Boys Town to put away the penalty with ease and restore the two-goal cushion. Parris also saw red a few minutes later, his frustration boiling over with his team crashing out. Robinson completed his hat-trick with a deflected shot that left the ‘keeper no chance. All games start at 3.15pm. Reply to "Manzan, Boys Town in Fishing Pond semi-finals"